These Sony cameras are being sold at quite similar prices. Therefore, a lot of people get confused, not sure about which model that they should choose. Sony a5100 alone is already a very popular model on the market, praised by many fans for the superb output quality and extraordinary capture speed, reminding about Sony a6000. On the other hand, Sony RX100 is also famous because of the quickness of taking a series of pictures, as well as the rich features. Let us compare that two models of sony’s product! Sony RX100 features a 20.9MP Exmor CMOS sensor that is notable for the fast speed. You would love Sony RX100 for its very low shutter lag time and very fast photo burst. Yes, Sony RX100 boasts only 0.15 seconds of shutter delay and 10 frames per second for continuous photo shooting, with 1/2000s shutter speed. These are excellent features if you use your camera often to capture and record fast actions and sports. To enhance its performance in this aspect, Sony RX100 is given in-camera image stabilization, and higher maximum flash sync at up to 1/2000s to reduce the effects of ambient light from a flash. It can also record 1080p Full HD videos at a satisfying 60 fps rate. The 3-inch LCD screen is very much pleasant to the eyes, as the screen has 1.2M dots. 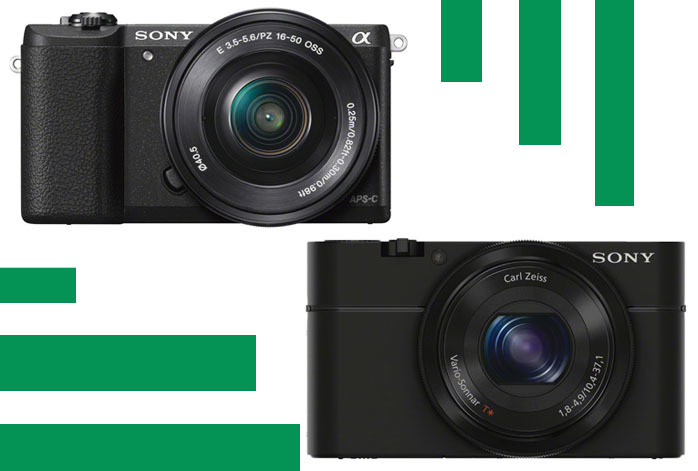 As the conclusion, Sony a5100 turns out to have more edges than Sony RX100. The given features make Sony a5100 considerably more versatile, suitable for various purposes and conditions. The higher shutter speed is also a big plus. Therefore, in general, you should choose Sony a5100!